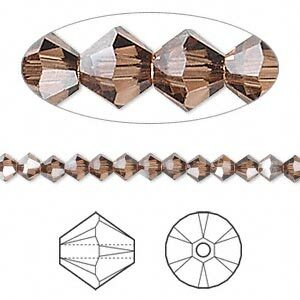 Bead, Swarovski crystal, Crystal Passions®, light smoked topaz satin, 4mm Xilion bicone (5328). Sold per pkg of 48. The fantastic look of Swarovski Crystal beads with Satin Effect Coating. Beads display a silvery, metallic appeal with a refined and sophisticated sparkle.